How do you fix a superpower with exploding levels of debt, that has a rapidly aging population, that consumes far more wealth than it produces, and that has scores of zombie banks that could collapse at any moment. You might think that I am talking about the United States, but I am actually talking about Europe. You see, the truth is that the European Union has a larger population than the United States does, it has a larger economy than the United States does, and it has a much larger banking system than the United States does. Most of the time I write about the horrible economic problems that the U.S. is facing, but without a doubt economic conditions in Europe are even worse at the moment. In fact, there are many (including the Washington Post) that are calling what is happening in Europe a full-blown “depression”. Sadly, this is probably only just the beginning. In the months to come things in Europe are likely to get much worse. Many believe that the euro will ultimately go much lower than this. Nations such as Greece and Spain are already experiencing deflation, and the inflation rates in Germany and France are both currently below one percent. If the European Central Bank starts injecting lots of fresh euros into the system to combat this perceived problem, that will lift the level of inflation but it will also further erode the value of the euro. 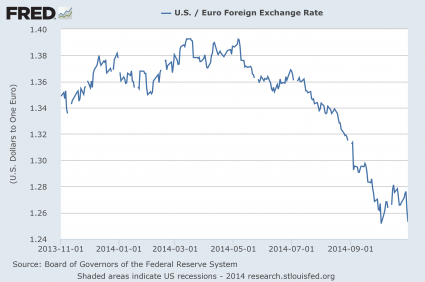 In the long run, it would not be a surprise to see the U.S. dollar at parity with the euro. When it happens, remember where you heard it. Market consensus believes that the eurozone is edging toward that moment when the scourge of deflation actually becomes a crippling reality. Eurozone data is constantly reminding investors that the region’s economy is barely limping along, as companies slash selling prices in a vain attempt to improve sales in the face of a weakening economy and evaporating new orders. Corporate deflationary reactions like this only hurt a company’s bottom line by squeezing profit margins even further. The obvious knock-on effect will limit resources for hiring and investing, which in turn only dampens any chances of an economic rebound, again putting the region into a bigger hole. In a desperate attempt to avoid widespread deflation in Europe, the ECB will inevitably take action at some point. It may not happen immediately, but when it does it will be yet another salvo in the emerging global currency war. Russia may ban the circulation of the United States dollar. The State Duma has already been submitted a relevant bill banning and terminating the circulation of USD in Russia, APA’s Moscow correspondent reports. If the bill is approved, Russian citizens will have to close their dollar accounts in Russian banks within a year and exchange their dollars in cash to Russian ruble or other countries’ currencies. Otherwise their accounts will be frozen and cash dollars levied by police, customs, tax, border, and migration services confiscated. That is not good news for the U.S. dollar at all. Expect wild shifts in the foreign exchange markets in the months and years to come. Turbulent times are ahead for the dollar, the euro and the yen. Getting back to Europe, let us hope that things stabilize over there – at least for a while. But that might not happen. In fact, things could take a turn for the worse at any moment. Most people don’t realize this, but European banks are even shakier than U.S. banks, and that is saying a lot. For example, the largest bank in the strongest economy in Europe is Deutsche Bank. At this point, Deutsche Bank has approximately 75 trillion dollars worth of exposure to derivatives. That amount of money is about 20 times the size of German GDP, and it is more exposure than any U.S. bank has. And Deutsche Bank is far from alone. All over Europe there are zombie banks that are essentially insolvent. Many of them are being propped up by their governments. Those governments know that if those banks failed that it would make their economic problems even worse. Just like in the United States, most economic activity in Europe is fueled by debt. So those banks are needed to provide mortgages, loans and credit cards to average citizens and businesses. Unfortunately, bad debt levels and business failures continue to shoot up all over Europe. The system is breaking down, and nobody is quite sure what is going to happen next. So keep an eye on Europe. In particular, keep an eye on Italy. I have a feeling that big economic news is about to start coming out of Italy, and it won’t be good. In 2014, we have been experiencing “the calm before the storm”. But 2015 is right around the corner, and it promises to be extremely “interesting”.